The meter is activated when the file is inserted into a root canal. The number of bars remaining before the file reaches the flash bar is shown in the lower left corner of the display. When the file tip reaches a position near the apex, the bar color changes to green to indicate you have reached a critical area. The small triangle on the right side of the meter indicates the point set for reference. The position of the apex is represented by the word “APEX”. The meter bars in this area are pink. The Root ZX mini’s large LCD color display impresses by being so easily readable – with its clear bar and high-contrast image. The positions of the flash bar and the memory bar can be set as guides for canal measurement and enlargement. The reference point for measurement or enlargement can be set anywhere between 2 and APEX. It can be used to mark the beginning of a sharp curve or some certain distance from the apex. It can also be used as a guide when the file size is changed for canal enlargement. The memory bar can be set only by the measurement state. Number of bars left before flash bar is reached (during measurement). Memory no. for flash bar (without measurement). Automatic calibration ensures accuracy and eliminates the effect of changes in temperature, moisture, etc. inside the canal,evenduring the treatment. In combination with the TriAuto mini you have a modular system that can be used flexibly. This enables you to carry out not only measurements but also preparation in the root canal. You can also obtain the TriAuto mini already combined in the Set TriAuto mini. Root ZX mini is available in 4 different colors: white, red, green and blue. I have had a Root ZX mini apex locator for a large number of years. Can I combine this with a preparation motor to get file position displayed during canal enlargement? Yes. 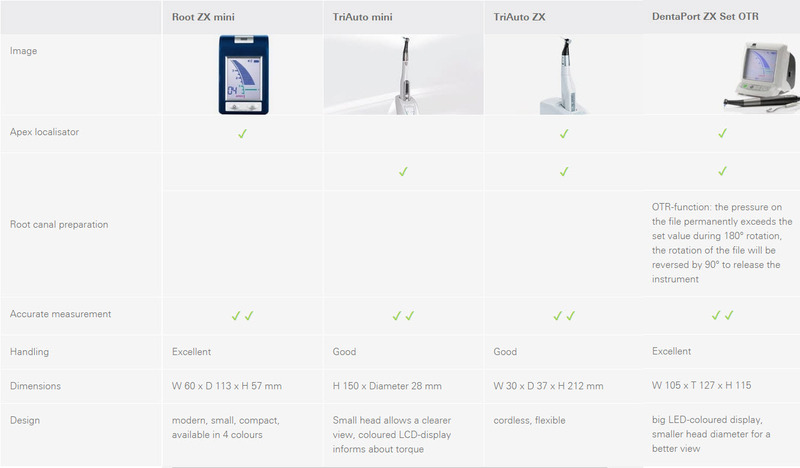 You can connect your Root ZX mini to a TriAuto mini endodontic motor using a connecting cable. This will provide you with a root canal measurement and preparation system. By doing so, you expand the functionality of your system. You can find further information about the product. My battery display only shows two bars. When do I need to replace the batteries? The batteries should be replaced soon. At best, replace the batteries as soon as the battery display starts flashing. Replace all three batteries with standard commercial batteries type AA. 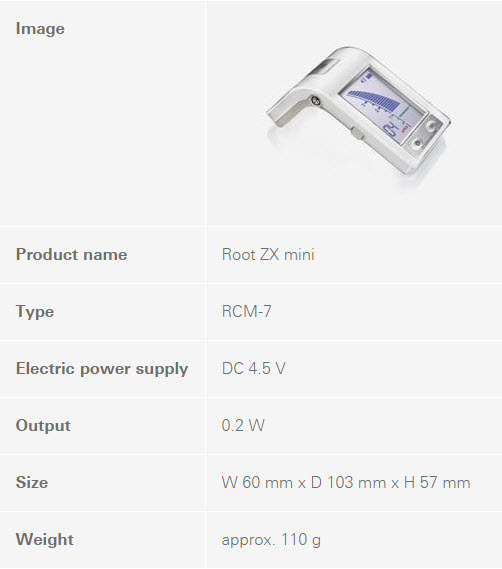 The X-ray exposure shows a different result to the electrical length measurement by Root ZX mini. Which method is more precise? The actual apical foramen and the anatomical apex often do not correspond exactly. The actual apical foramen can be located in the direction of the dental crown. The X-ray exposure then shows incorrectly that the file has not reached the apex. Which parts can I autoclave?